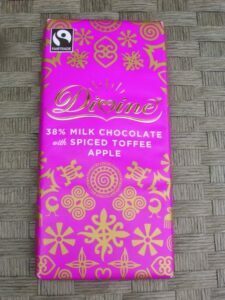 When I was sent the bar of Divine spiced toffee apple chocolate that I reviewed on Day Four of Chocolate Week, delicious as it was, I knew I had to make something with it – something suitable for bonfire night on 5th November. Read on for my spiced toffee apple bonfire cakes recipe. As it happened, I made them for a presentation I was giving at the end of a course I’ve recently been attending. If you want to keep an audience sweet, you can always try distracting (read bribing) them with cake. That’s my philosophy and it seemed to work. I had apples from my mother’s trees, salted caramel leftover from the salted caramel cake and a lovely bar of Divine chocolate – it was time to get creative. Toffee apple chocolate chip cakes with a pool of apple sauce in the middle and salted caramel dripping down the sides was my vision. You can see what I did from the recipe below. 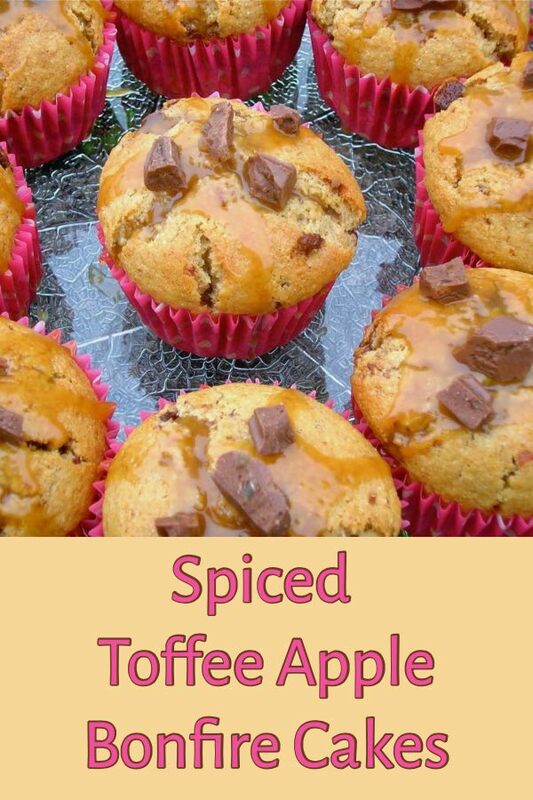 The spiced toffee apple bonfire cakes were sticky, soft and chewy all at the same time with lots of different appley and toffee flavours bursting out of them. They were both sweet and slightly tart and the salted caramel set them off nicely. Sticky as these cakes were, I’m not at all sure they’d be suitable for eating around the bonfire, not with gloves on and scarves flying about. However, they’d be perfect to welcome you in from the cold afterwards or to set you up before going out. Little chocolate chip cakes, filled with spiced apple sauce, then drizzled with salted caramel. This makes a lot more sauce than is needed for the recipe, but it's very nice atop a bowl of steaming porridge at this time of year. Peel, core and chop the apples. Place in a pan with a dash of water, the rum, sugar (add more if you prefer it sweeter) and cinnamon. Simmer gently until the apples are soft. Make sure they don’t catch on the bottom of the pan, but don’t add too much extra water as the sauce needs to be thick. Purée with a stick blender and set aside. Pour the vinegar into the milk, stir and leave to curdle. This is a quick way of making cheat’s buttermilk. Sieve the dry ingredients, including the caster sugar into a large bowl and make a well in the centre. Break in the eggs, add the melted butter and stir gently from the middle outwards adding the milk gradually as you go until everything is just mixed. Gently stir in 60g of the chocolate. Place a tbsp of batter at the bottom of twelve muffin cases. Drop in a heaped tsp of apple sauce and cover with the remaining batter. Take a cocktail stick and swirl the batter and sauce around a little. Bake at 180℃ for 23 minutes or until the cakes are well risen and firm to the touch. Leave to cool for a couple of minutes, then turn out onto a wire rack to cool completely. Drizzle the salted caramel over the tops whilst still warm, then scatter over the remaining chocolate. Bonfire Night is the theme for this month’s Tea Time Treats with Janie over at The Hedge Combers and Karen at Lavender and Lovage. These spiced toffee apple bonfire cakes fit right in. 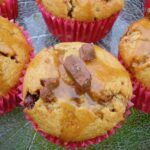 With salted caramel languishing in the fridge and in need of using up, I am joining in with this month’s No Waste Food Challenge which is being hosted by Manjiri of A Slice of Me, but normally lives over at Elizabeth’s Kitchen Diary. With Bonfire Night being all about light, these cakes fit in nicely to Diwali, the Hindu festival of lights. So I am entering these into Dish it Out – Diwali Bash over at Cooks Joy. These also goes to Love Cake over at JibberJabberUK where the theme is In with a Bang this month. And these go off to Lucy for #CookBlogShare over at Supergolden Bakes. If you make these spiced toffee apple bonfire cakes, I’d love to hear about it in the comments below or via social media. A photo is always good too. For more delicious and nutritious recipes, follow me on Twitter, Facebook, Instagram or Pinterest. Spiced Toffee Apple Bonfire Cakes. PINIT. Definitely going to try them out. Would love to know how you get on if you do try this Jessica. Chewy, moist and sticky…that sounds just as good as pudding. These apple muffins look glorious! I can send some virtually Gem! These sound SO good! Perfect for bonfire night (and lunchboxes too!). Yes please! My order is on its way! 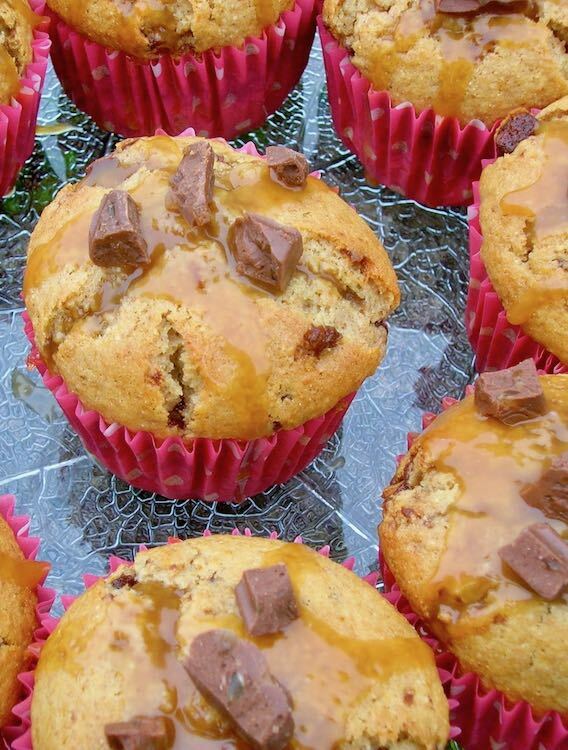 These look amazingly good….. that little pool of caramel…… and such an inviting list of ingredients….. Very dangerous recipe (in the nicest possible way). Stop, stop, I can’t keep up! I have just been reading your tiffin post (again), distractedly stuffing my face with our equivalent of rich tea biscuits and dark chocolate because I felt a) inspired but b) too greedy to wait to make it! Haha, your version sounds a lot healthier than mine Lucy. Yummy!! im going to try it. Let me know how you get on Pat. Wow, these sound delicious! 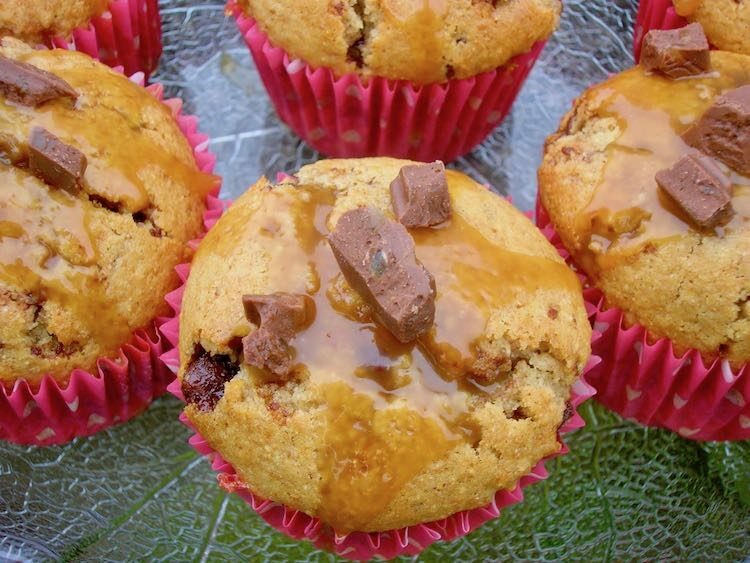 I love cakes with apple, love salted caramel and love chocolate… Seems I NEED to give these a go! Oh no Sylvia, what a huge pain. I hope you get it fixed soon. These sounds really yummy! And so pretty! Divine bonfire cakes with divine chocolate. Love the idea. What a fabulous idea and they look amazing. Pass one this way! It was a tough one Johanna. I did get to eat 20g of it and it was very good. I hope you’re not trying to say, it shouldn’t be topping any cakes or puds Kath! Ah, what a relief! I think I’m inclined to agree with you. Mmmm.. toffee and apple, I like that. I could have it at any time of the day. Great way to use apples too. Thanks Lucy. It’s got to be the spiced cider – sounds wonderful. I need some of these now to warm me up! I love the chunks of chocolate on top. These look like a real lick-your-fingers-afterwards sort of muffin. Thanks for linking up.